The 28-foot tides create tremendous currents swirling around the islands at the Western end of the Bay of Fundy. Frequent fog also complicates navigation through these channels. West of the Islands is Passamaquoddy Bay with the peninsula of St. Andrews and the St. Croix River estuary at its western extremity. In 1604 Champlain and de Monts attempted the first French settlement in North America here because these natural barriers gave some protection from marauding pirates. 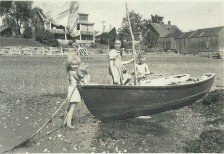 During World War II St. Andrews became a relatively safe haven for the Canadian navy for R&R. The local people provided a hostel and friendship to the war-weary sailors. The home where my brother Michael Caughey and I were raised fronts on St. Andrews Harbour. Ships anchoring just outside the harbour were in clear view of the house. On the day Britain declared war on Germany I had just turned three and Michael was four years and two months old. Our mother, an "Upper Canadian" from Ontario, appreciated the uniqueness of our location, and allowed the two of us, on our own, to explore the nearest confines of the harbour in our flat bottomed rowboat. If we came aground on an outgoing tide, the skiff was so heavy Mike and I couldn’t push off, so we would just drop anchor and walk home. When the wind was right we could erect a wooden mast, standing it in a hole in the forward seat. The single sail propelled us, a centreboard reduced the sideways drift and a rudder attached to the stern of the boat allowed us to steer a steady course. 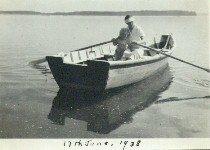 Then we would give our arms and blisters a break from rowing, and listen to the music of the gurgling water and slapping wavelets against the hull. This was bliss. One magical summer morning, when a light breeze rippled the sparkling waters and the tide was rising, we begged our mother for permission to sail beyond the harbour and around a visiting destroyer. She eventually relented and we set a course for adventure. When we reached the ship the sailors leaned over the stern to talk to us. One claimed he was my brother too. He took out a partial plate and, when we smiled, both of us displayed missing front teeth. The commotion caught the attention of the Commander who invited us on board. We were given the grand tour. I can still remember the greasy feel of the metal gratings in the engine room on my bare feet and the austere neatness of the captain's cabin where we had juice and cookies. Before we left the ship the sailors showed us how to rotate the anti-aircraft guns and raise and lower the barrels to aim at seagulls. Our last surprise was that the sailors actually knew how to maneuver our little boat from one side of the ship to the other. 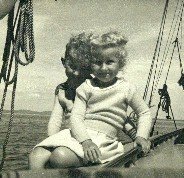 Some sailors took a happy memory of two curly-haired towheads back into a bloody war and two greyheads still remember their hospitality on a sun soaked day almost sixty years ago. 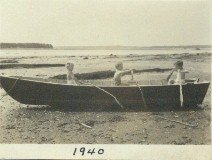 I was almost eight and Mike had just turned nine on the summer of this adventure, 1944. PS The destroyer pictured above is the HMCS Haida which Michael remembers coming to St. Andrews during the war, but the name of the ship we visited is unknown.